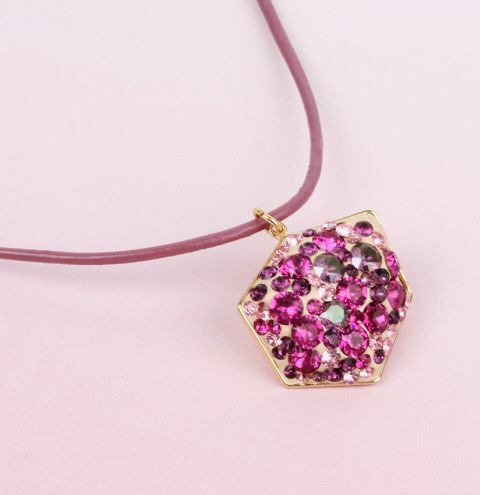 Make yourself a statement necklace that dazzles in the light with NEW Swarovski Cerlun clay and the fancy dice setting. Cut a length of cord to the length you would like your necklace. Attach a jumpring to your pendant and thread this onto your cord. Try placing the each end of your cord into your cord ends to check that it will fit when glued. If the cord doesn't quite fit, trim it to a point to thin down the end. Add a drop of glue into the cord ends and slot in your cord to dry. Attach a jumpring to each of your cord ends and a lobster clasp to one side.